Our first 4K UHD Disc Review!!! It’s only fitting that it would be an IMAX film. Aircraft Carrier: Guardian of the Seas gets the deluxe treatment from Shout Factory with an Impressive Transfer and a few Extras. Mainly, it’s the amazing transfer you will want to check out. IMAX films are not home video experiences… normally. True IMAX experience is overwhelming; Giant screen that covers your entire field of vision, sound that you feel in your soul, and amazing visuals. With that said, a 4K UHD disc of an IMAX film if done properly is not the same experience but an entirely awesome experience none the less. Aircraft Carrier: Guardian of the Seas is just that kind of experience. One that anyone with a halfway decent set-up will is reference quality. The film taking place over a week-long “War Game” called RIMPAC. RIMPAC brings together Nation’s Navy to Embark on real-life war scenarios. It is a chance for The U.S. and its allies to show off some of their most modern (and most are top secret) weapons and fighter jets. Those weapons and planes along with the newest Naval vessel Is all attempt to “best” each other. The film is not a documentary meant to go deeply into RIMPAC, rather show the scale and amazing visuals that few but Naval crews have Ever seen. The soaring with F-22’s, watching how fighters take off and land on Super Carriers are the main attraction. Anyone that wants a lesson in Geo-Political War Games really should look elsewhere, as the awesomeness of the machinery is front and center. Like most IMAX documentaries this is all about scale. In the hands of director Stephen Low, the director of no less than 15 IMAX docs, it’s all about efficiency and less about style. IMAX Aircraft Carrier: Guardian of the Seas is a great Visual and Auditory Experience weather at home or in IMAX. The disc will definitely test your system be it your 4K monitor or your home theater sound systems (those lucky enough to have Dolby Atmos, this does come with a track). The disc comes equipped with Dolby Vision along with the 4K resolution. And this is where the disc’s presentation shines. The Vision refines color, and contrast above and beyond the normal standard Blu-Ray Disc. In the Vision version, one will Marvel at the sharpness of the image but also the refine but almost microscopic grain structure. This is by far one of the best UHD discs I have seen. Please note Dolby Vision requires to have both a 4K Monitor and player capable of playing said format. NOTE: All special features are on the UHD disc and presented in 4K. Audience Testimonialsare just that, 5-minutes of various audiences from a Screening discussing their enthusiasms for the film. F-35 vs. Bugatti vs. Human Cannonballis a small funny segment that discusses the speed and who is the clear winner in this proposed (faux) race. Usain Bolt vs. Giraffe vs. Nuclear Carrieranother funny albeit short segment who would win in a race. You’ll have to tune into the segment to find out which does. F-35 Navy Selects Reelis 6-minutes of beautiful B-Roll Footage. This isn’t temp or incomplete but fully rendered 4K UHD grade footage of the F-35 fighter. Those Fighter Jet junkies will definitely want to watch this as the footage is impressive to say the least. 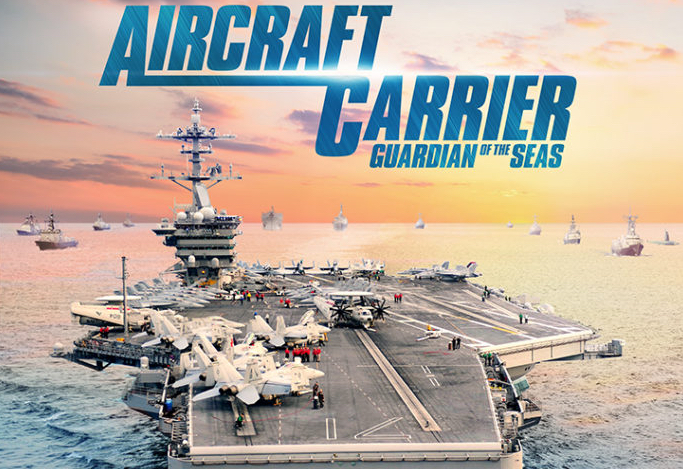 Aircraft Carrier Trailer & TVSpots rounding out the bonus materials are the Trailer and TV Spots for Aircraft Carrier: The Guardian of The SeasBUT also about 15-minutes worth of additional IMAX shot documentaries, again all in 4K!!! Shout Factory has turned out an amazing 4K Transfer (with Dolby Vision no less) for this IMAX documentary. Those with the right equipment will definitely want to snag this one up as the transfer and sound are reference quality. HIGHEST POSSBILE RECOMMENDATIONS!!! !